None of us likes to clean, but I’ve discovered a few shortcuts that can cut cleaning time in half so you can spend more time enjoying your meals and less time cleaning up after them. t As a chef, mom, recipe curator and full-time food blogger, I have to clean my kitchen daily. It’s not something I look forward to, and in fact, it’s the least glamorous part of my job. For that reason, I’ve discovered the following shortcuts that can cut cleaning time in half. t Filth begets filth. If you start cooking tonight’s dinner while the dishes from last night are still sitting there, the mountain of leftover plates will slowly take over your cooking space. If your dishwasher or sink is empty, it will be easier to load as you cook, and you won’t have to worry about your dishes piling up on the countertops. t This is actually a great cooking tip as well. It’s so much easier to follow a recipe when you don’t have to step away from it every few seconds to get an ingredient. You also won’t feel like you have to rush, digging through cabinets or the pantry to find what you need. t If you’re done with the eggs, put the rest of them back in the fridge. If you’ve finished using your hand mixer, put the attachments in the dishwasher or sink and put the appliance back. This will make the overall cleanup much easier, and it will free up your workspace so you can focus on the task at hand and check off the tasks you’ve already completed. t It’s a good idea to have a separate workspace and separate tools when working with raw meat and fish. Dedicate all of your attention to working with the raw food until it is fully prepared and in the oven or on the stove. This way, you won’t risk exposing foods you plan to leave uncooked to tools and space that raw food has touched. Have a separate cutting board and counter area for work with all raw food. t The saying “Too many cooks in the kitchen spoils the soup” could not be more relevant than when used literally. I don’t care how popular those frantic cooking shows are. If more than one person is doing the cooking, things get messy fast! Take the lead. Set the ground rules. We love it when families cook together, but in order to keep the kitchen clean, each person has to take responsibility for his or her own workspace, ingredients and cleanup. t While the cake is baking or the roast is in the oven, use that time to do one last sweep. Make sure your dishwasher is now loaded with all of the tools used to cook. If it’s full, run it so you can make space for the dishes that are coming. If there are dishes in the sink, clean what you can in the time you have so you have room for the pots and pans that are left. Wipe down your countertops one last time. Set your plates out so you can immediately serve your food. 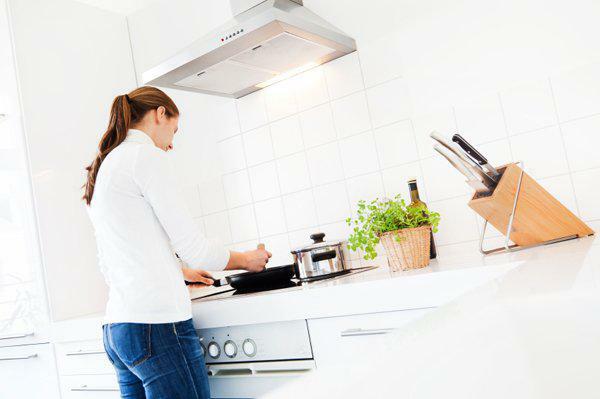 t All of these tips will help our home chefs keep a clean kitchen, which is something that I guarantee will make cooking more enjoyable for everyone.